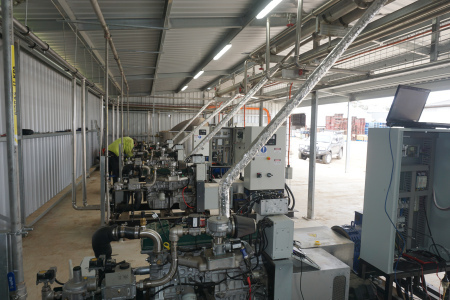 Cogeneration (or CHP for 'Combined Heat & Power') is where we generate electricity using a specially designed generator that allows us to capture the heat it produces generating this electricity and use this as well. This heat could be used for heating your premises, heating a swimming pool, providing hot water services and even steam for cooking and cleaning. If you need 'Combined Heat and Power' Generation, Inoplex can help. Our Cogenerators use industry leading technology to generate heat and power when you need it. The main advantage of CHP Cogeneration is efficiency and therefore energy savings. Conventional electricity generation only converts around 40% of the energy put into the power plant (fuel consumption) into electricity. The remaining 60% is wasted as heat. A cogeneration power plant captures this wasted heat and utilises it for something useful; maximising energy usage. 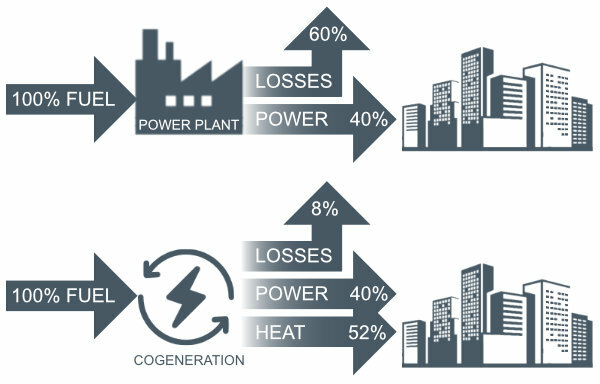 While a standard generator will only create one form of energy (electricity); a cogeneration plant will create 2 forms of energy (electricity and heat). An Inoplex cogen generator is designed to produce the heat and power you actually need, with class leading efficiency. It achieves this by monitoring the site power and heating requirements every second and adjusting the prime mover or engine settings to provide the optimal configuration to suit your needs. Many cogenerators on the market today, are essentially electrical generators with added components to recover the heat produced by the engine. As these are primarily generators, they are set up and tuned to maximise electrical efficiency. These are acceptable solutions if you only really need electricity and a bit of heat as a by-product. But if you have varying requirements of electricity and heat throughout the day, these cogenerators are inefficient and won’t provide you with the best solution. The Inoplex cogen generator has industry leading load following technology for both electricity and heat usage. It will adjust the prime mover (or engine) speed and operating conditions to vary the heat and power output as required by your site. Our load following, CHP generator is unique, as few cogenerators can adjust both their electrical and thermal outputs with a degree of independence. Let’s use a piggery as an example, but the same scenario applies to a whole range of different industries. During the night you have a higher thermal demand to provide warmth for the animals but less need for electricity. An Inoplex Cogenerator will produce the small amount of power you need, whilst maximising maximum heat generation. Then during the day when your staff are running a range of electrical motors and your heating requirements decrease, the cogen generator will run to produce electricity with a reduced heat output. If you had purchased a traditional cogenerator, then overnight when the power demand was low, your engine would be running less and therefore have a lower heat output. Then during the day when there is a high electrical demand, your engines would be running more and therefore producing a lot more heat; when you don’t often need it. In fact, you’d probably end up having to add electrical heating to provide extra heating overnight – all adding to your costs and lowering efficiency. We do this by decoupling the power output from the engine speed. This is achieved through our market leading Power Electronics. Speak to our team to find out more about how our inverter cogenerators and power electronics help to create clean, efficient electricity and heat when you need them.